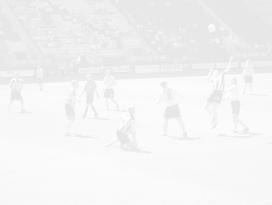 Much was expected of Chas and Dave's draw specialists - a team that had proved so difficult to beat in the relegation dogfight of the previous season. 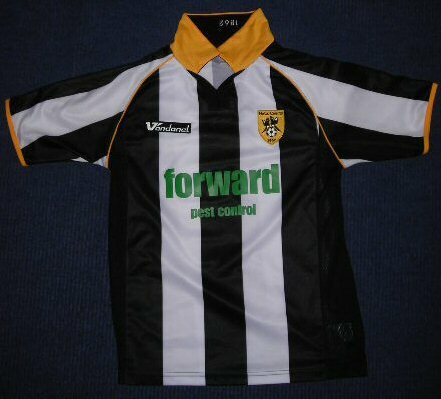 Once again, a County manager had persuaded some decent names to pull on the famous black and white stripes. Jamie Forrester came from Lincoln and the two loanees, fans favourite Michael Johnson and keeper Russell Hoult, decided to make the move permanent. This reinstated the strong back line that had made The Pies so hard to get past at the end of the last campaign but with a forward line that, for once, had teeth. Add to this the fact that the home fans had finally acquired the accoustically-superior Kop and everything was suddenly sounding very promising..promotion challenge here we come then ! Signs were very much the order of the day when the new season kicked off. All the stands sported new ones with their name on and the Jimmy Sirrell also boasted the club's title of 'Oldest League Club in the World' .Less conspicuously, this sign is on the wall just outside the players changing rooms. The long-suffering fans dug deep to celebrate their return to The Kop by buying a huge flag for away trips and dispay at home. 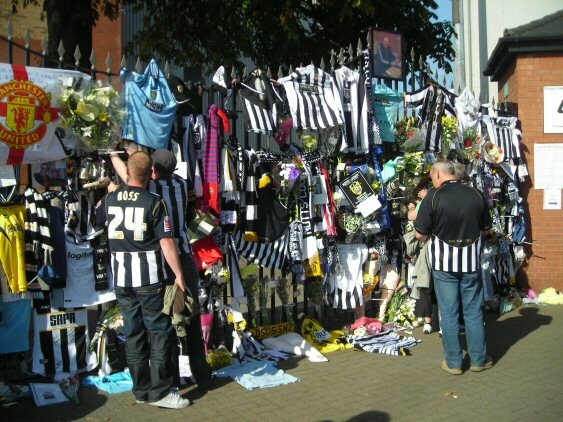 Fans pay their respects to the legendary manager Jimmy Sirrel who died in September. Another season, another kit - such are the demands on the pockets of long-suffering fans. One such fan though, went one better, with a sponsorship of the first team shirt through his company, 'Forward Pest Control' and although this proved a contentious logo - its theme and colour attracting mixed responses, the good design of the shirt attracted very positive comment. This was the first year for a while that the home and away kits attracted different sponsors.Our verdict - the sponsor's logo should be in gold, then it's up with the best ! 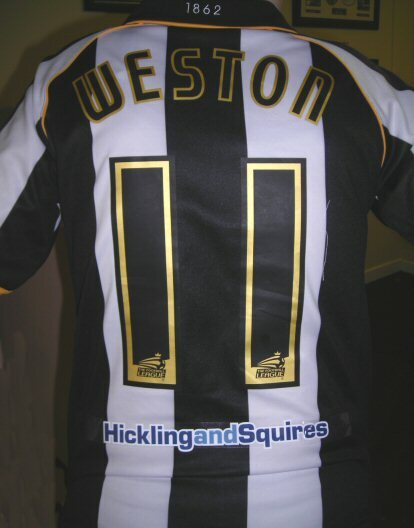 Notts had a competition amongst its sponsors for a chance to get their name onto the shirt. Hickling and Squires won the deal and hey presto ! A unique matchworn shirt appears with a very distinctive feature ! The usual promise soon disappeared. After some very good early performances, the Maggies' inability to turn a draw into a win saw them acquiring points only at a rate of one at a time. Eventually the more definite results came and they were usually defeats. 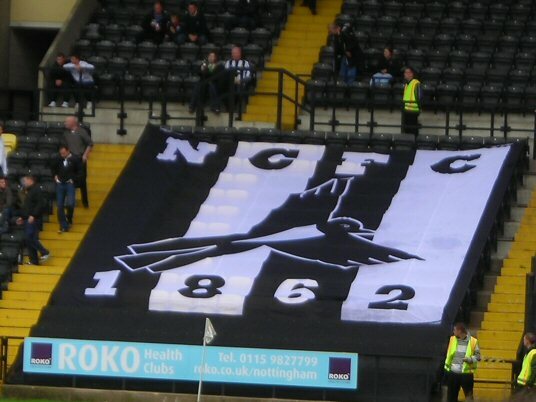 Added to this, the club lost two faithful servants this season - Jimmy Sirrel in September and later, Jack Wheeler. Fortunately for the Pies, three clubs suffered points deductions - Rotherham, Bournemouth and Luton and although, ultimately, only the last one of the three actually went down, it did give Notts a safety net and allow their bad run of games to go unpunished. As the season ended, fans favourite, Michael Johnson hung up his boots and the tears on the terraces as he walked around the pitch after his last home game may have been equally for the passing of the two other lost legends. With struggles in the boardroom matching the poor performances on the pitch, the golden age of the Pies could never have seemed so far away.